Attach this accessory to any 1 NIKKOR lens featuring a 40.5 mm filter-attachment size, and you can get closer to subjects and capture close-up shots with blurred background easily. 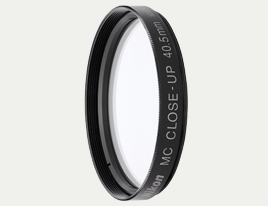 Simply by attaching the N1-CL1 to any 1 NIKKOR lens that features a 40.5 mm filter-attachment size, minimum focus distance of the prime lens is shortened, and you can capture subjects at a larger size. Even when using a lens with longer minimum focus distance, you can get closer to subjects, enabling image expression utilizing background blur. When attached to a lens such as the 1 NIKKOR VR 10-30mm f/3.5-5.6 or 1 NIKKOR VR 30-110mm f/3.8-5.6, you can take shots like those achieved with a micro lens. Even the 1 NIKKOR VR 10-30mm f/3.5-5.6 that originally features a high reproduction ratio achieves a clear effect. This accessory is ideal for those who want to easily take close-up shots of flowers or for tabletop photography, for example. When the N1-CL1 is attached to the 1 NIKKOR VR 30-110mm f/3.8-5.6, you can approach the subject as close as approx. 0.24 m from the tip of the N1-CL1 and the maximum reproduction ratio of the prime lens is increased, making the image of the subject larger by approx. 3.8x. When the N1-CL1 is attached to the 1 NIKKOR VR 10-30mm f/3.5-5.6, the minimum focus distance from the tip of the N1-CL1 is shortened to approx. 0.09 m and the maximum reproduction ratio is increased up to approx. 0.76x (when converted to 35mm format), enabling the easy capture of shots resembling those taken with a micro lens. With its approx. 10 g weight and 7 mm thickness, superior portability is ensured. Because you can instantly get closer to subjects simply by attaching it to the tip of a 1 NIKKOR lens, you won't miss decisive shutter opportunities. The frame delivers a natural color tone and refined texture. Its well-balanced design, achievable only by a genuine Nikon accessory, is perfectly demonstrated when attached to a 1 NIKKOR lens.